The pearl, taken from mussels in the freshwater rivers of the state, is the official state gem, as designated by Public Chapter 192 of the 91st General Assembly in 1979. Between the years 1882 and 1914, beautiful pearls were taken from many of the state’s streams and rivers, from the Pigeon and Holston in the east to the Forked Deer and Obion in the west. The Caney Fork in Middle Tennessee was noted for its pearl-bearing mussels, and “pearling” was a favorite sport for young people on Sunday afternoons at the turn of the century. Tennessee river pearls are of all colors and they are “natural,” as the mussel made them—all pearl, all the way through. They have been found in various shapes—spherical, pear-shaped, and baroque or irregular. After World War I, dams were built on many of the rivers, and the mussels lost their swift and shallow shoals. Also, the waters became more toxic, and pearling became unprofitable. Today, pearling exists as a by-product of shell harvests, which supply the cultivated pearl industry of Japan. 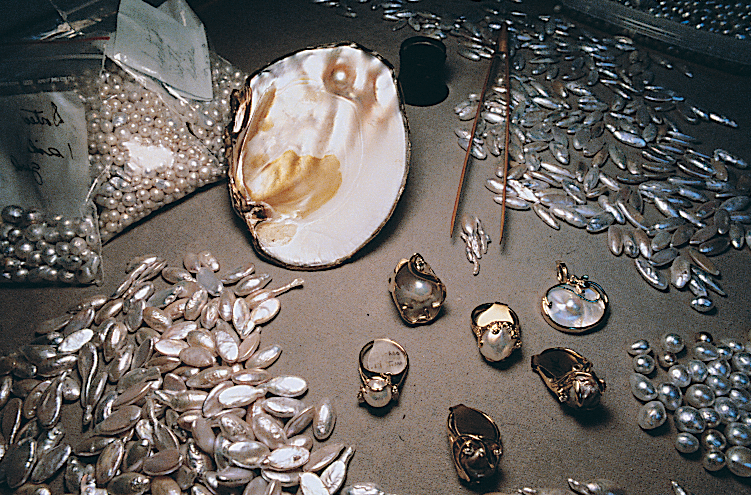 Tennessee river pearls are among the most beautiful and durable in the world. At Camden in West Tennessee, these river pearls are collected and crafted into rings, cufflinks, stick pins, and other jewelry. The historic Tennessee River Freshwater Pearl Farm and Museum located in Camden, Benton County, is the official site of freshwater pearl culturing in the state, as designated by Public Chapter 506 of the 103rd General Assembly in 2004.